The sole birthstone for July, ruby is the brightest and boldest of all birthstones. Called ratnaraj, meaning the "King of Gems" by ancient Hindus, ruby's association with the blood of life has earned it powerful praise and high esteem since antiquity. Ruby is mentioned at least four times in the Bible, always in reference to beauty and wisdom. Its passionate red color makes ruby an ideal choice for a romantic gift that comes with a rich legacy. refractive index, birefringence, pleochroism, magnification and spectrum. 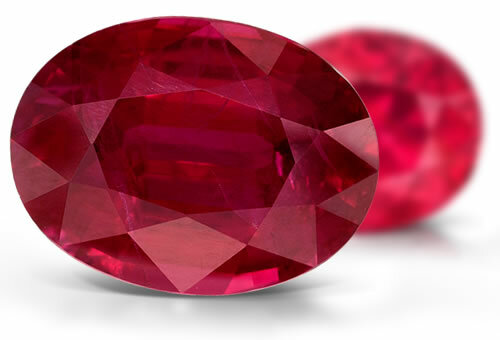 The observation of natural internal characteristics is a key element in distinguishing natural ruby from its synthetic counterparts. This stone has type II clarity. Sometimes rubies have silk, rutile, boehmite, apatite, calcite or zircon crystals, fingerprint and negative crystal inclusions. Some stones show hexagonal growth and color zoning. Untreated stones will usually have inclusions intact. Heat treated stones will have fracture halos, discoid fractures or snowballs around crystal inclusions (untreated stones from magmatic areas might also show these characteristics). Silk will be broken and might show sintered areas especially around the girdle.